We've been keeping an eye on all you busy bees writing for fanzines, blogs and magazines, and have rounded up a selection of our favourite Indietracks reviews and other coverage for you to check out. We've picked out some of our fave quotes and provided links to the full reviews where possible. And we'll keep updating this as the coverage comes in. Happy reading! 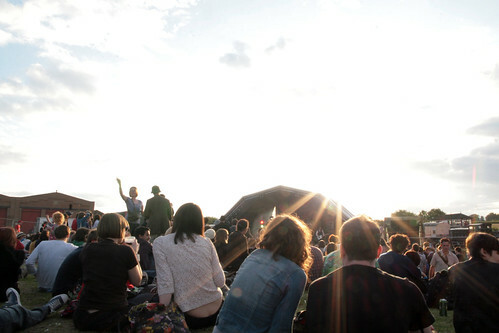 "Although only in its third year, Indietracks has already built up a reputation as the UK’s best festival of its size…. Indietracks is possibly the only festival bar ATP where every other act is something of a new discovery, and this year was no exception." "There is something magical about this festival and I can't believe it's over for another year. They've done a superb job yet again, the outdoor stage and craft workshops were a great addition and the team always make us feel welcome, and with the help of the staff of Midland Railway who seem to wear smiles 24/7, who wouldn't want to return for more next year." "Gigs on steam trains, chilling in a 1950s buffet car and fanzine workshops ... is Indietracks the most eccentric festival ever? " "Now in its third year, Indietracks has sprung up from very modest beginnings to be one of the UK’s most endearing and eccentric festivals. The line-up represents the very best of the indiepop underground." "What more could a girl want than a tiny little festival on the Midland Railway, a little tram/train hybrid to and from the campsite, talks by Fortuna Pop and a little marquee with an ever-changing timetable of Tatty Devine rarities, band merch, brooches… ? Essentially, it’s heaven." "Microfestivals have a reputation for being simultaneously more eccentric and meticulously thought-out than some of the majors. July’s Indietracks took place at Midland Railway in Butterley, Derbyshire, where visitors could enjoy listening to live performances by Teenage Fanclub and Camera Obscura between taking free rides on a still-operational Fifties steam railway." "It's an occasion when artists and the paying public mix together as one, with no pretence, no egos and nothing of the corporate juggernaut. It's merely about the music…. If you want the continual musical sugar rush offered up here, then there can be no better event on the calendar." "Whether it's the location, the populace or the sheer joy of pretty much all those who play, no matter what their prior experience, Indietracks does something to people that leaves them grinning." "What made the event extra special was the cosmopolitan element. The seminal independent record label, Elefant Records, which is based in Spain, celebrated its 20th anniversary by hosting the artists who took to the main stage. These included home-grown wonders such as Camera Obscura and Teenage Fanclub, who headlined the event on Saturday and Sunday respectively, as well as a plethora of international talent." "From its inauguration in 2007 to its blossoming existence today, Indietracks might be one of the smallest festivals in Europe, but that's its beauty. It cares not for corporate sloganeering and strives to create a diverse spectrum of music from all over the globe." "Indietracks has mixtape exchanges, DIY fanzine and bunting activities and is put together and policed by those doing it for love - for music, for old trains or even for both. Long may it continue. " "Indietracks festival in Derbyshire has found a particular niche: indiepop fans with a yearning for the golden age of steam." "The atmosphere was as friendly as a Fat Controller after three Melton Mowbray pork pies, and extremely well organised with awesome, inspired music and toilets that never ran out of loo roll. Perfect." "It’s hard to see how Indietracks will be anything other than the most enjoyable event of the year." "Près de 50 groupes ont joué avec ferveur, sans égo, constamment mélangés aux fans (jusqu'à dormir dans le même camping pour la plupart, ce n'est pas tous les jours qu'on croise Emmy The Great allant prendre sa douche) et partageant un amour sans failles de la musique. " "Indietracks 2009 was, in these eyes, an utter triumph…. You could probably leave your Nan on her own at Indietracks whilst you went to buy a pint, and you'd come back and not only would she be chatting to her new best friends; she'd have a Smittens t-shirt on, too. And the best thing is - no-one's got a clue where this atmosphere comes from." RadioNowhere aired an Indietracks 2009 Special on Monday August 10th. You can now download the show as a podcast, which includes music and conversation from Camera Obscura, Teenage Fanclub, Au Revoir Simone, The School, Emmy The Great plus much much more! We'll be adding to this list over the next few weeks, so pleased drop us a line if we've missed anything interesting.